Ever stop in front of a real estate office and fantasize about living in a foreign place? Best-selling author Mary-Lou Weisman and her husband dare to act on their dream of international living by impulsively renting a house in the south of France. Their experiment is detailed in Mary-Lou’s funny travel memoir, which is packed with anecdotes that are both witty and insightful. 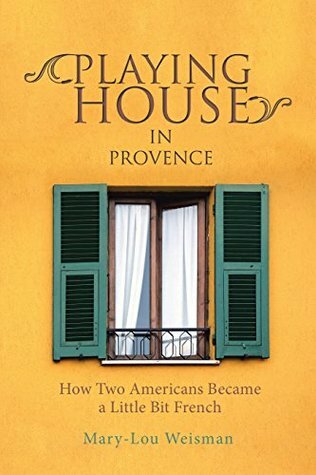 Here is an excerpt from Playing House in Provence: How Two Americans Became a Little Bit French. 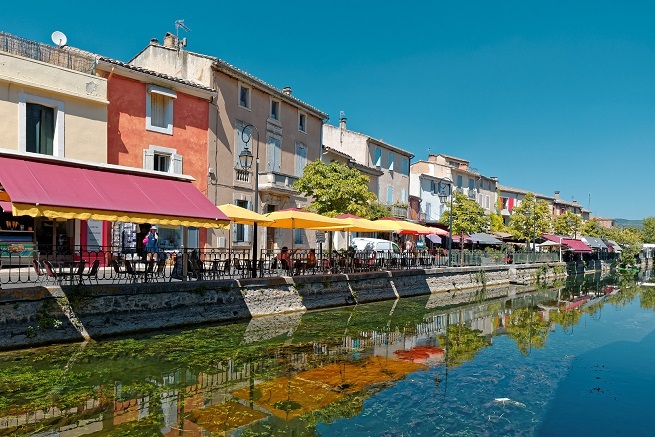 If it’s Monday, it’s Cadenet; on Tuesdays it’s Apt; the big Wednesday market is in St-Rémy-de-Provence; Thursday it’s Aix-en-Provence; on Fridays, Lourmarin; and on Saturday, it’s Uzès. 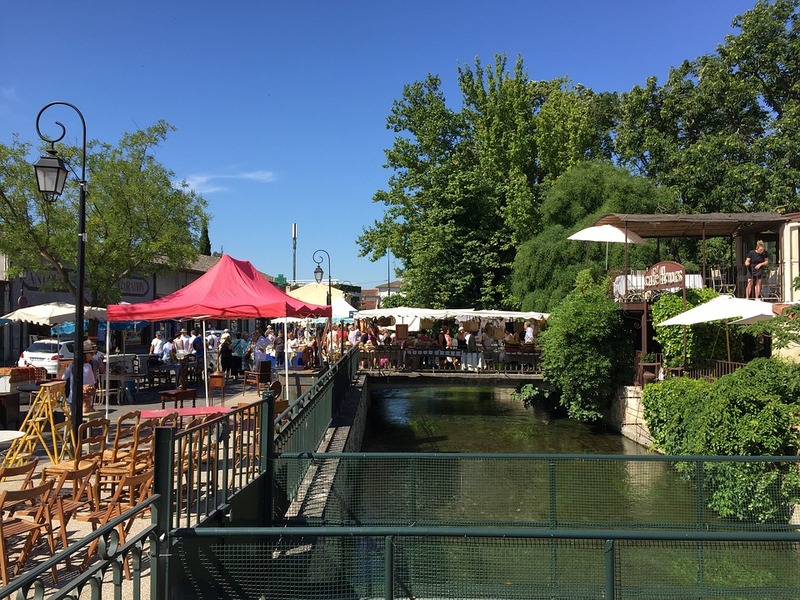 Sunday belongs to L’Isle sur la Sorgue, the largest, most copious market in the immediate region. 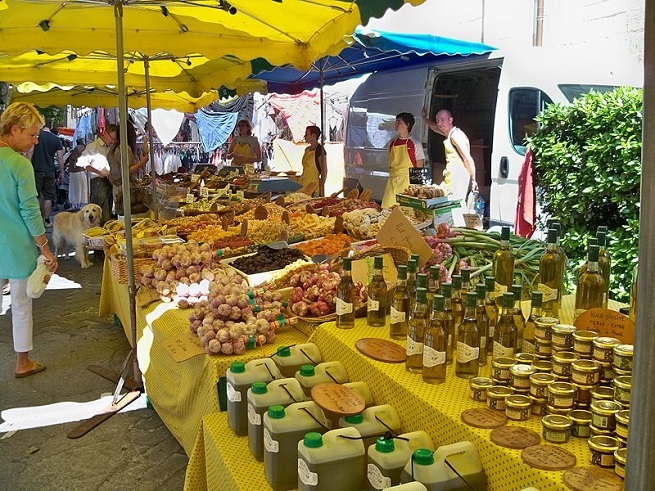 Part flea market, part food market, part circus, part social gathering place, and part country fair, the markets are the most defining aspect of traditional Provençal life, and therefore a great way to absorb the culture, which is what we’re after. My husband Larry and I are, as usual, among the eager crowd. We’re market junkies and besides, we’re also on a mission. 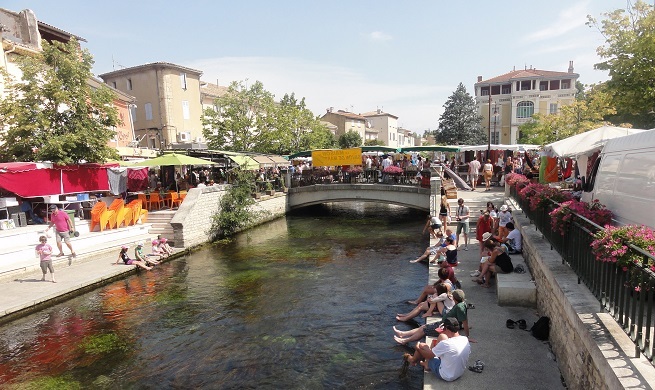 For the past three Septembers we’ve been renting houses in this area, studying French, shopping at the outdoor markets, hanging out in cafes, and otherwise trying to live la vie Provençale. Our goal is to see how French we can become. So far, not so bon. At the outdoor markets, some French women still carry genuine French paniers, straw shopping baskets, with leather handles, although small white recyclable plastic bags are taking over. In ecologically sensitive American towns where plastic bags are also no longer available from merchants, French paniersare getting a handhold, at least among the pretentious. My first act is to buy a panier into which I cannot wait to add a baguette. When you’re pretending to be French, props matter. The atmosphere among vendors and customers alike is festive and friendly. Even as the vendors hustle by offering potential customers free samples of cheese and sausages, they pause to chat. The goods are displayed attractively in pottery bowls and baskets, on makeshift tables and stalls. A giant, carbon steel pan of paella looks like a still life. Prices are written in pencil or ink on cutout squares of cardboard, or in chalk on small-framed slates, the kind French children carry to school. Or it pleases me to think they still do. What makes the markets especially authentic and appealing is that the customers are waited on by the very farmers who have grown the food they’re selling. Inevitably, modernity has inserted itself into the traditional weekly markets. An amplified rock band sets up in front of the charcuterie. In another part of the marketplace, a woman in peasant clothing cranks out “Under the Bridges of Paris” on her hurdy-gurdy. One has the sense that she’s been cranking away anachronistically for years. In the household appliances section of the market, Larry and I fall under the spell of a fast-talking salesman who is demonstrating a many-bladed vegetable device that curls cucumbers into spirals, sculpts radishes into tulips, and shreds carrots into confetti. We buy one and go home to try it out. It cuts fingers into ribbons. We must restrain each other from trying to acquire all of Provence. We take turns talking each other out of ridiculous purchases. While I’m stroking the patina of an eighteenth century cobbler’s bench and asking the dealer how much it would cost to send it to the united States in a shipping container, it is Larry who knows how to deliver the coups de réalité by reminding me that we can’t afford it, and besides, it wouldn’t fit in our kitchen. Similarly, Larry may not buy the clippers that can cut through bamboo. “We don’t have any bamboo,” I remind him. We let down our guard when we make our way toward the food. After all, one must eat. We pause to choose among rows of bright-eyed fish lying gill to gill. We buy gleaming green, brown, and black olives, each color in its own oval basket, each basket supplied with its own long-handed, rough-wooden spoon. We scoop out some of each, count out coins, and move to the pates, sausages, cheeses, fruits, salads, and tiny delicious strawberries – so fresh and unlike their sell-by-date, steroidal American cousins that molder within a day, Provençale berries remain fresh and succulent for at least a week. The market is a great place to practice our French. Larry is becoming a regular at the grattons stand. That’s where they sell his favorite food group, grease. Since he can’t afford foie gras, he’ll settle for grattons, fried duck skin. He elicits a smile of recognition from the vendor, followed by what has become a ritual exchange. “Bonjour,” says Larry, “Ça va? “S’il vous plaît,” Larry answers. The vendor grabs a handful and deposits it into a paper bag. “A la prochaine,” Larry calls back. We smile and wave goodbye as if parting from a good friend. These are the moments we live for; conversations, however trivial, in real-life situations with actual French people who don’t know us and might even think we’re French, at least for a split second. During the rest of our market stroll, Larry will toss one gratton after another into his mouth, as if they were peanut M&Ms. I keep my mouth shut, but I’m thinking, quadruple bypass.